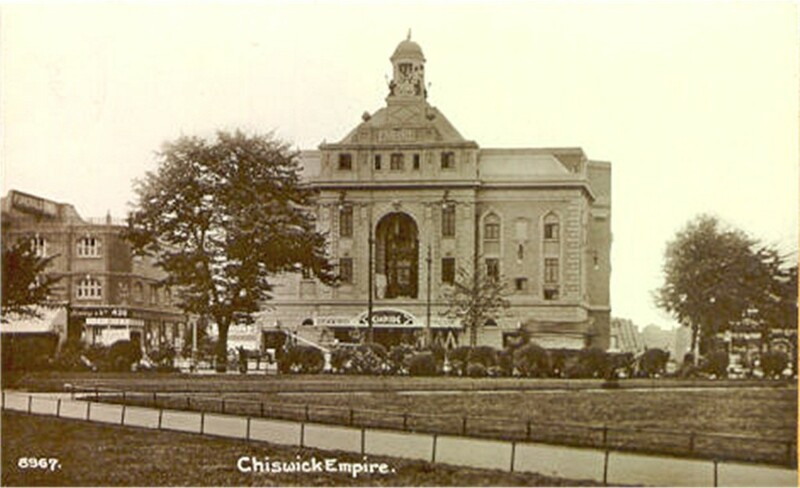 Chiswick High Road Action Group (CHRAG) is an amorphous group comprising local residents and business people. It is committed to supporting good sustainable development of the Chiswick High Road Area. 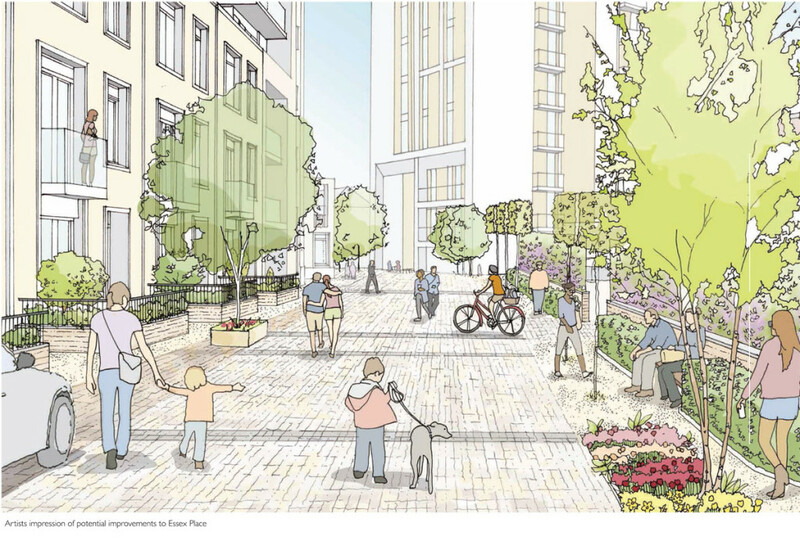 The development site with its excellent transport links is suitable for uses consistent with Hounslow’s Local Plan including office, hotel / conference, community / institutional and open space. Such uses would represent socially and environmentally sustainable development, as well as being financially sustainable. What is proposed is adding purely residential units. This removes the opportunity for other uses of a large part of central Chiswick forever and endangers its sustainability. CHRAG is determined that the opportunities afforded by this site should be exploited to benefit sustainable growth for the future of those who live and work in, and those who visit, Chiswick. The development makes no contribution to the future sustainable development of Chiswick. Lend Lease’s vision of the future of Chiswick. Essex Place (behind Chiswick High Road, next to Sainsbury’s). No new mixed-use buildings – just residential buildings aimed at the high-end executive market. No affordable housing. Lend Lease have planning permission for the conversion of Empire House to residential under permitted development, something over which the local planning authority had no control. This permission applied to the floor plate of Empire House itself. Lend Lease now proposes to extend this block both upwards and outwards, and in addition seeks permission for new residential developments on other areas of the site. 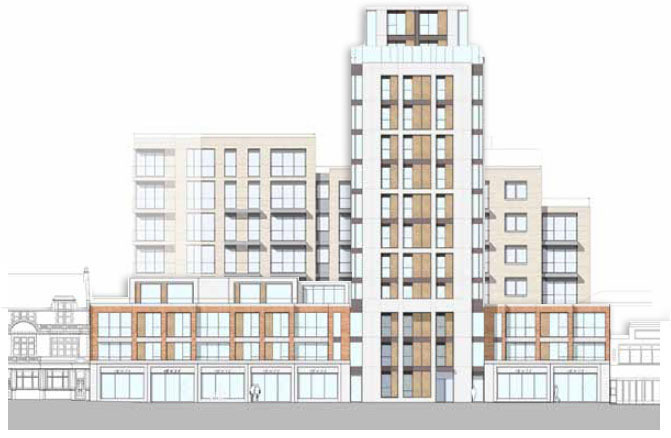 This includes a 7 and 8 storey block on a car park that has not been subject to a previous planning application, and a 5 storey block on a car park that does have existing permission for residential development. The proposal provides residential units at the expense of local amenity and is ultimately a block to sustainable development of this part of Chiswick. Affordable Housing gives the opportunity for someone with an average income to be able to afford to buy. Developers are required to allocate a proportion of affordable housing within a given housing development. This ensures a healthy mix of new residence. Despite clear requests Lend Lease has refused to provide any information about Affordable Housing and their contribution to infrastructure amenity. CHRAG believes this reflects an approach focused on maximising profit at the expense of any other considerations. The presentations given at the exhibitions and on the developer’s website obscured important aspects of the development. The increased height and width of Empire House and the bulk and extent of the additional tower blocks was hidden. Pictures were used that obscured the nature and mass of the development. A rudimentary online survey conducted by CHRAG shows results that are diametrically opposed to Lend Lease’s assertions of public opinion. In fact the proposals only public realm offer is to create a narrower road with greater traffic load, increase the total car requirement in the area while creating no additional car parking space. Lend Lease sketch of their new enlarged tower. Balconies barely visible, and proposed Essex Place missing from the picture. 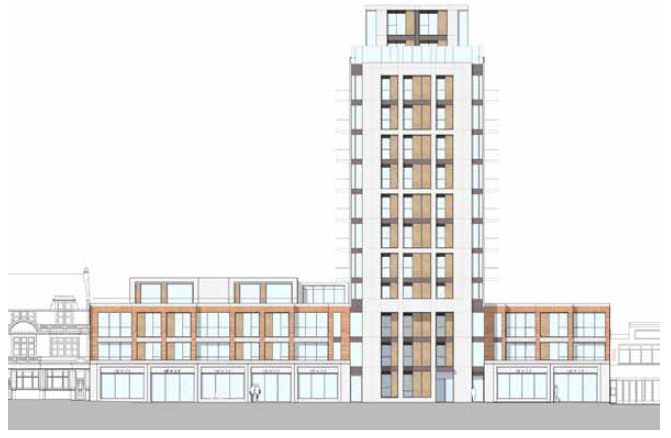 The existing tower block, Empire House, is described by Hounslow Council in the Turnham Green Conservation Area Planning Statement as being of “obtrusive height”. The current application seeks to raise the height and to project balconies, which will further increase the appearance of bulk, whichever direction it is viewed from. Drawings are not completely clear but it appears that there may be recessed balconies in the south facade, overlooking Turnham Green, and projecting balconies on the west and east elevations. The image Lend Lease refused to show us. 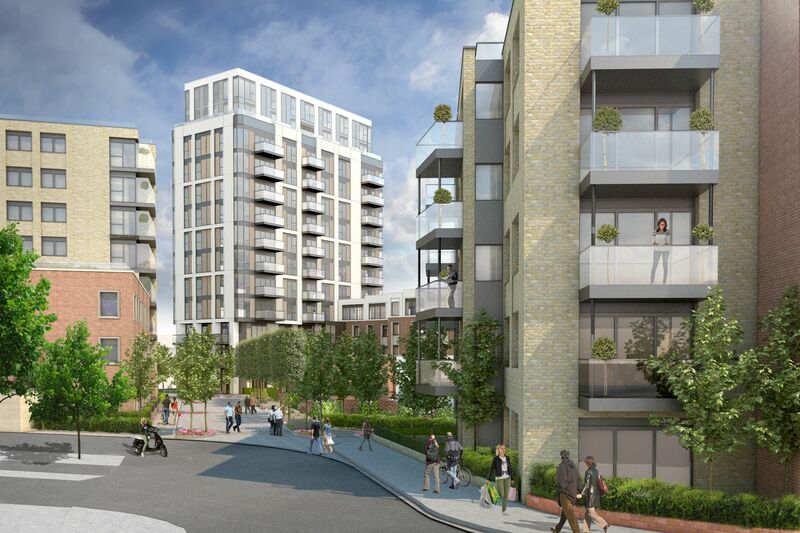 A composite 2D representation with Empire House superimposed on a developer’s drawing of the Essex Place development. Whilst it is possible to draw projecting balconies to imply they have minimal visual impact, the reality will be that this already bulked-up mass of tower block, will appear to be even fatter. There is no justification in permitting this obtrusive tower to grow bigger again. 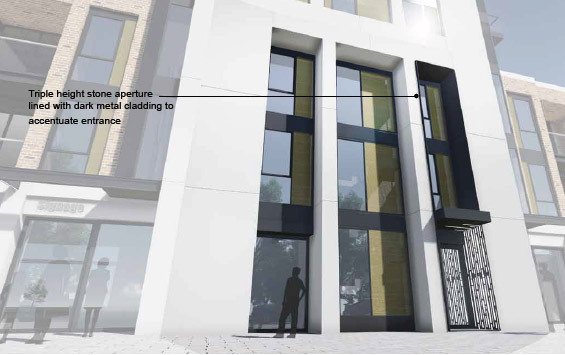 The main entrance proposed into the enlarged Empire Tower from CHR, is a three-storey tall “portico” with a recessed glass and sheet aluminium wall surface behind. The Design Statement’s assertion that this emulates the grandeur of the original theatre would be laughable if it were not meant seriously. The original theatre was extrovertly ornate and decorative Frank Matcham Baroque, with a 3-bay central section of the frontage being a two storey “triumphal” arch opening over the ground floor marquee. “Grounding” the tower, as referred to in the D&A Statement, by dropping eleven storeys of the cliff-face of the building straight down to pavement level, is no way to reduce the detrimental effect of its bulk on the skyline or as a backdrop to Turnham Green church or to the Conservation Area. The Acton Lane block faces across the road to Chiswick Park station. The station building is Grade 2 Listed (= Heritage Asset) and one of a group of important inter-war Deco stations by Charles Holden. Other recent mundane developments which have been permitted nearby should be no excuse for yet another. Planning authorities have a duty to protect the area around Listed Buildings from inappropriate developments which damage or detract from that building or its setting. Irrespective of arguments about whether the development should be permitted at all, the totally unsympathetic architecture of the buildings proposed should be rejected. The entrance to the road serves a further 21 flats in Acton Lane and bifurcates to provide access to Sainsbury’s car park and delivery yard. The traffic on this road will be heavy – the child and his dog playing in the middle of the road are a fiction of the architects’ imagination and a misleading visual by the developers. The high buildings on either side of Essex Place (13 storeys on one side, 7 and 8 on the other) will make it more like a dark windy canyon. “Promoting pedestrian use of Essex Place through the creation of shared space” simply means putting down some kind of friendly paving. This in no way reduces the amount of traffic. “Providing opportunity for external integrated play space, seating and general amenity” has actually resulted in no space designated for play; there is one bench shown in the images, and that fronts directly onto the roadway. The beautifully-drawn planting in the images will have to be very mean to allow for the delivery access. The front entrances from the houses and flats open almost directly onto the roadway with a small amount of tightly controlled planting to protect the first steps out of the houses. The proposed design of this building should be rejected in favour of a building of architectural merit in conformity with local policy. 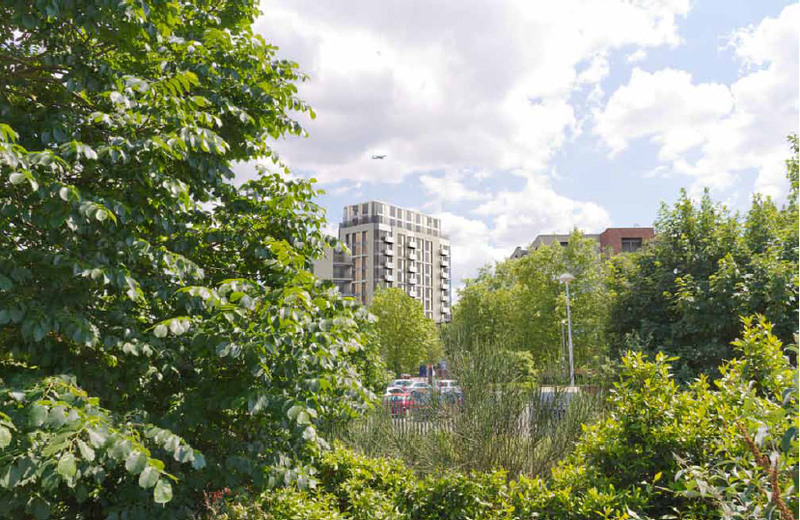 Overall the proposed development fails to improve the public realm and, if allowed, would represent a significant degradation of the public realm and a blow to sustainable development of this part of the Chiswick area of Hounslow.